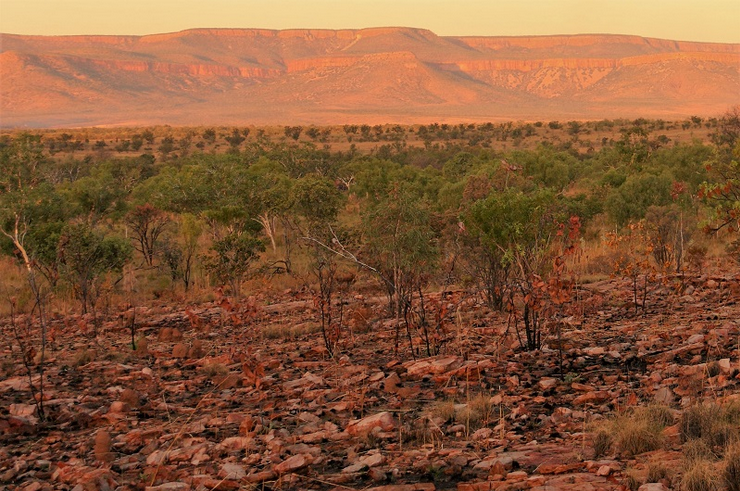 The Kimberley region, in Western Australia, is the stuff of Outback dreams. 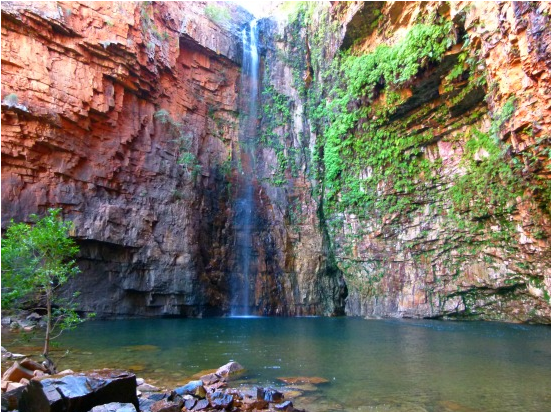 An ancient landscape covering hundreds of thousands of square kilometres, the Kimberley is one of the most ancient places in Australia. The remote proximity and isolation of the Kimberley only adds to the complex beauty of its landscape. 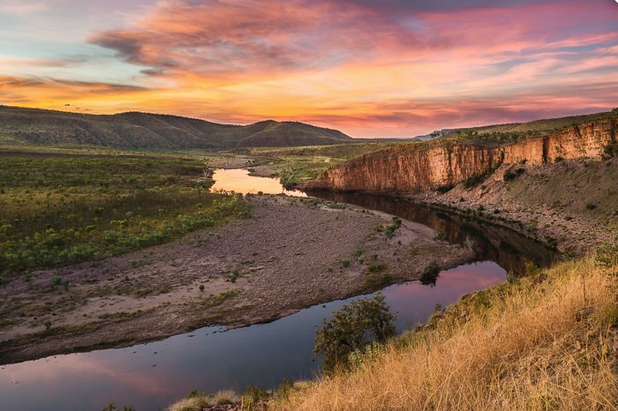 One of Australia’s last frontiers, the Kimberley is a land of remote and spectacular scenery made up of a huge central plateau of dissected sandstone ranges and an extensive limestone range, formed from an ancient barrier reef. Here you'll find majestic canyons, freshwater swimming holes and several outback stations, as well as one of Australia's greatest 4WD road trips. 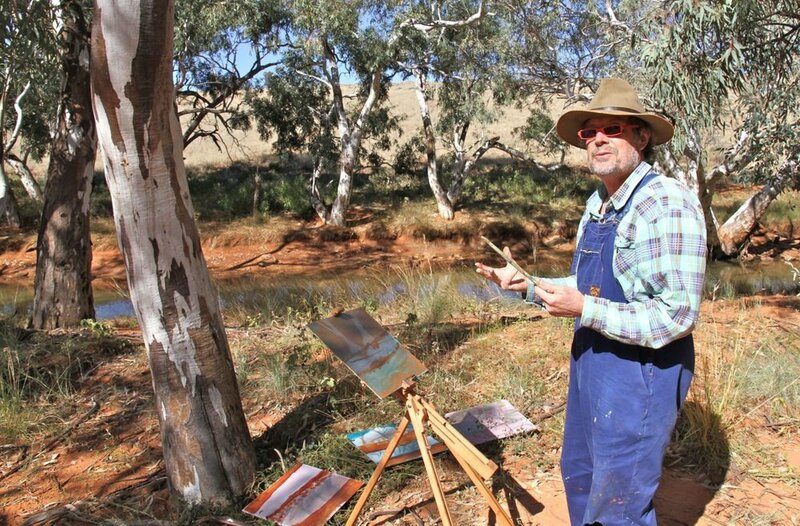 Leading Australian contemporary landscape painter, Idris Murphy, is one of the most individual and highly respected artists working in Australia today. Recently, he was one of the featured artists in the SBS documentary Two Thirds Sky Artists in Desert Country. Murphy is a respected educator and artist who has been the driving force behind the promotion and building of a series of accommodation and studios for both Australian and International artists in the outback of NSW. Idris Murphy’s work is held in the public collections of the National Gallery of Australia, National Library of Australia, Federal Parliament House Art Collection and the Art Gallery of NSW, State Library of New South Wales and the State Library of Queensland. Idris is represented by King Street Gallery, Sydney. Idris has a deep connection with the wild, empty spaces of the Australian landscape. In his work he aims to capture its spirit rather than its physicality. Bridging the gap between figurative and abstraction, and inspired by Indigenous painting and storytelling, his paintings are dreamlike, expressionistic and raw. This 10 day outback expedition focuses on getting a feel for the landscape through exploration both by driving through the country and painting and drawing directly from nature. Participants will improve their skills under the guidance of artist and experienced educator, Idris Murphy. During the workshop, Idris will expose the students to a variety of ideas and approaches with a mix of one-on-one tuition, demonstrations and informal discussions over meals in the evenings. Non painting partners are very welcome. Kununurra is the gateway town to the East Kimberley, and a great place to begin our adventure. The area is home to ancient landscapes, lakes, rivers, waterfalls, strangely shaped boab trees and gorgeous swimming holes. 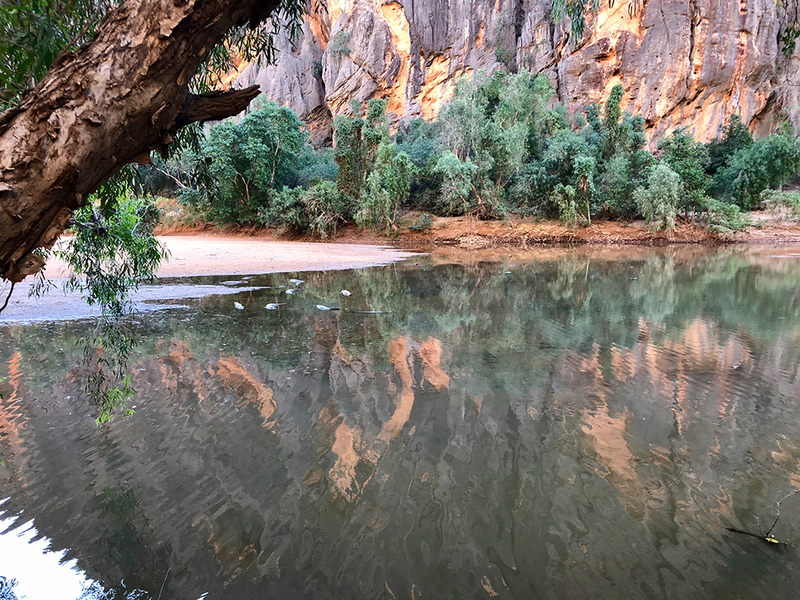 It’s easy to see why the name means "Big Water" in the language of local Aboriginal people, who have roamed this landscape for thousands of years. From here our 4WD adventure begins. 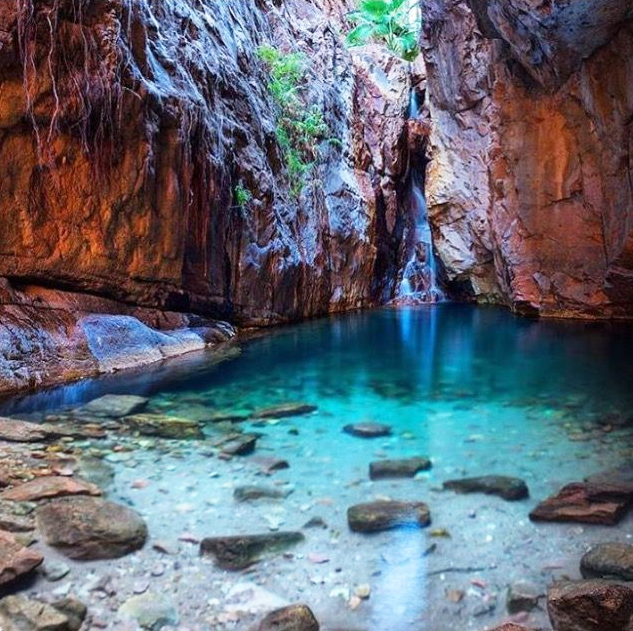 More than 700,000 acres in size, amid the vast and ancient landscape of Western Australia’s East Kimberley region, sits the untamed natural beauty of El Questro Station. 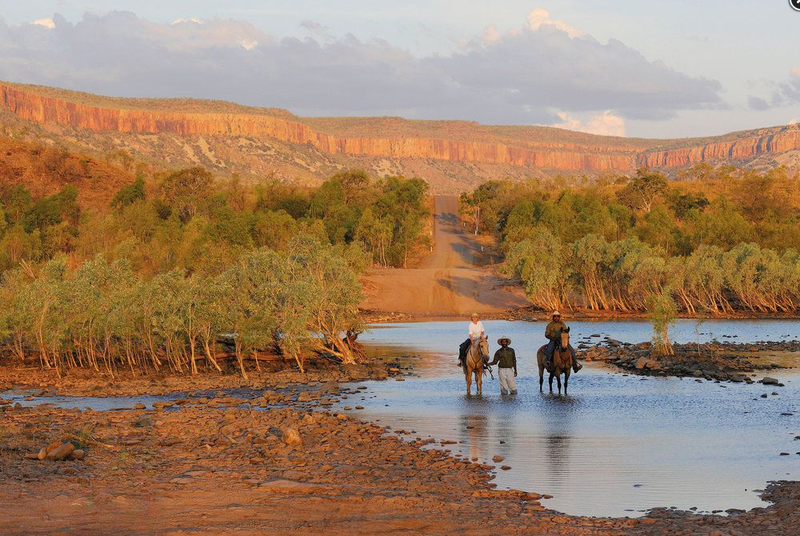 Here you’ll explore one of Australia’s last true frontiers. From deep gorges and majestic mountains to thermal springs, mud and salt-flats, rainforests and cascading waterfalls. El Questro Station is the ultimate outback experience. Owned by the Indigenous Land Corporation on behalf of the Balanggarra people of the East Kimberley, Home Valley Station is a working cattle farm which hosts an onsite training program for Indigenous men and women from the region, who are studying tourism, hospitality and a range of pastoral operations. Set against the rugged beauty of the Cockburn Range, Home Valley Station starred in the 2008 Nicole Kidman and Hugh Jackman movie Australia. The property has a breathtaking combination of towering gorges, sparkling waterfalls, billabongs, and stunning ancient landforms and ranges. The Kununurra Country Club is a four-star, centrally located resort, at the gateway to the amazing East Kimberley region, where we will be staying for two nights at the beginning of our journey and one at the end. The next three days will be spent on El Questro Station with two nights at the Emma Gorge Resort in comfortable safari-style tented cabins, with en-suites, surrounded by natural bushland. All of the cabins are powered and have fans, linen, towels and outdoor dining areas in the shade of ancient Boab trees. The stunning beauty of Emma Gorge, is on your doorstep. of our trip. You can choose to stay in the spacious and ultimate comfort of the Grass Castles on idyllic Bindoola Creek or in comfortable Guesthouse rooms. The Grass Castles are designed for guests seeking the ultimate in luxury. Shaded by towering eucalypts abundant in birdlife, the Grass Castles are reminiscent of sturdy steel and timber homesteads designed by the Kimberley’s early pioneering settlers with an ultra-modern fitout. The Guesthouse rooms offer an insight into the the cattle station history. Although new and very comfortable, there use of similar materials helps to retain the sense of history.